The present book is devoted to the peculiarities of the use of a personal computer for mobile (cellular) phones the most well-known companies-developers (AL-CATEL, ERICSSON, MOTOROLA, NOKIA, SIEMENS, SAMSUNG, SONYERICSSON et al.). 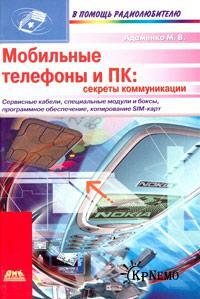 The first chapter contains information about the equipment that is necessary for connecting the mobile phone to the PC. The scheme and drawings of printed circuit boards, as well as tips on making special service cables. The second chapter discusses the software used to unlock (decrypt) the most popular models of mobile phones, for firmware improvements and other purposes. Examples of the use of certain software products. The third chapter is devoted to a special device used for programming the memory circuits used in mobile phones, and the service equipment. The fourth chapter focuses on the issues related to the SIM-card: reading and writing data, cloning SIM-cards; Entry one SIM-card information contained in several SIM-cards, etc. Are concepts appropriate service equipment as well as recommendations on how to use it. The Appendix contains drawings of service connectors most popular models of mobile phones and the table with the appointment of contacts. This publication will be useful not only to specialists, but also the owners of mobile phones, since it would learn more about the advanced features of existing devices and use them in everyday life.